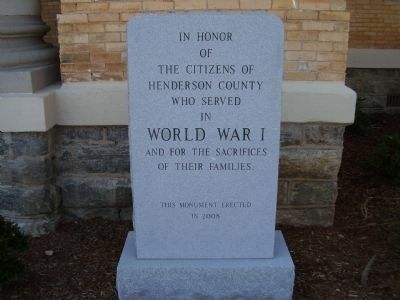 In Honor of The Citizens of Henderson County who served in World War I and for the sacrifices of their families. Location. 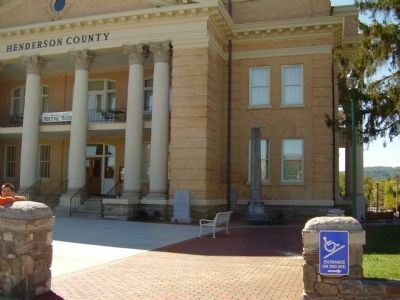 35° 18.881′ N, 82° 27.608′ W. Marker is in Hendersonville, North Carolina, in Henderson County. Marker is on N Main Street. Touch for map. 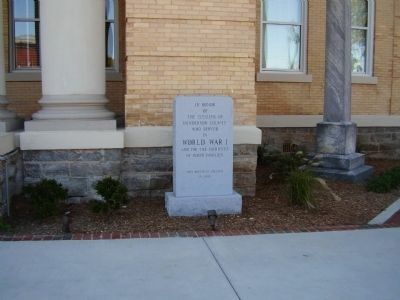 Marker is in this post office area: Hendersonville NC 28792, United States of America. Touch for directions. Other nearby markers. At least 8 other markers are within walking distance of this marker. Civil War (here, next to this marker); Revolutionary Soldiers (a few steps from this marker); World War II (a few steps from this marker); Korean War (a few steps from this marker); Hendersonville Vietnam Memorial (within shouting distance of this marker); Hendersonville Gulf War Memorial (within shouting distance of this marker); Hendersonville War Memorial (within shouting distance of this marker); Nuckolls Building (within shouting distance of this marker). Touch for a list and map of all markers in Hendersonville. More. Search the internet for World War I. Credits. This page was last revised on June 16, 2016. This page originally submitted on July 2, 2009, by Stanley and Terrie Howard of Greer, South Carolina. This page has been viewed 624 times since then and 3 times this year. Photos: 1, 2, 3. submitted on July 2, 2009, by Stanley and Terrie Howard of Greer, South Carolina. • Kevin W. was the editor who published this page.